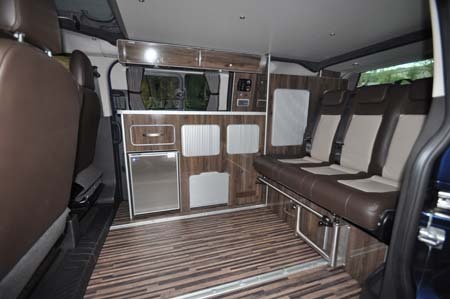 If the base vehicle for this most modern of campervans is nothing but avant-garde, take a closer look at how well Wellhouse has complemented it with a conversion of considerable style. No standard Transit this, Wellhouse is building on a successful formula it landed upon with Hyundai, where it used the i800 MPV as the base rather than going down the more traditional route of adapting a van. 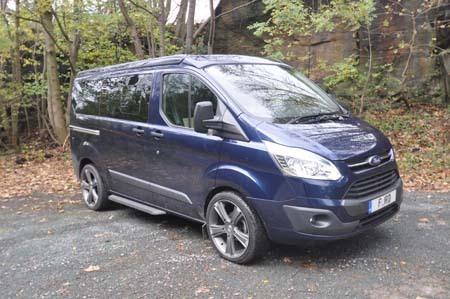 Hence, the Terrier here starts off as the altogether more passenger-friendly Tourneo (again, an MPV) version of the new Transit, in Custom Trend trim. 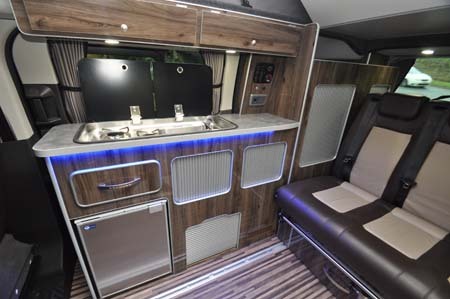 As with Hyundai, too, Wellhouse has worked in conjunction with leading campervan component supplier Reimo from Germany on key fittings such as the elevating roof and safety-tested rear seat system. The result is a simply stunning camper that was unveiled at October’s Motorhome and Caravan Show and has already wowed sufficiently to make the judges at MMM/Which Motorhome (the UK’s two leading motorcaravanning magazines) the number one new campervan in its annual Motorhome of the Year Awards. What is especially enticing here is Wellhouse has managed to keep the starting price under £40,000. Start comparing that with Volkswagen T5 conversions and you’ll see the differences getting ever wider. As for like-for-like specifications, taking into account both the base vehicle and the camper side of things, the Terrier knocks all-comers into the corner of the field marked “pretty basic”. Performance is far livelier than the 123bhp suggests, too, and it’s all supremely refined. 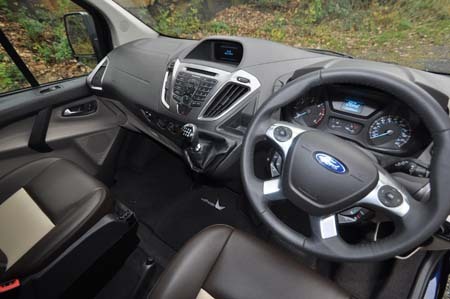 Nevertheless, and typically Ford, it’s very high-geared, although arguably the biggest bonus of this is economy around th3 40mpg mark. Unfortunately, an automatic transmission option doesn’t figure in Ford’s thinking. There’s no getting away from the seriously well equipped cab though where, just as importantly, everything falls so easily to hand. See the spec’ panel below, plus there’s also a superb stereo system here that has to be heard to be believed. 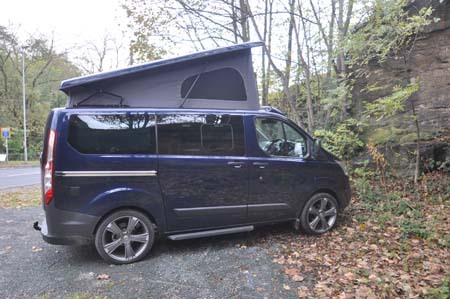 True, the elevating roof section takes it over the critical 2m height, but inside this is a five-seater that provides sleeping accommodation for two as (the roof bed is a £395 option here). It may retain the twin sliding doors, but the offside is for service purposes only, although it also acts as a great way to retrieve the portable toilet that’s part of the standard inventory. Perhaps it’s no surprise, also, to see it’s a layout that you can call “standard VW”, with furniture until running along the offside. The gloss finish to the furniture combines with some very sophisticated LED lighting – both ambient as well as direct, but with all kinds of features such as dimmability, touch on/off etc. There’s also a lot of practicality to fittings such as the main curtains. Key features don’t stray too far from a standard offering of two-ring hob and sink plus compressor fridge, but the diesel-fuelled heating system is, again, a lovely luxury to contemplate. 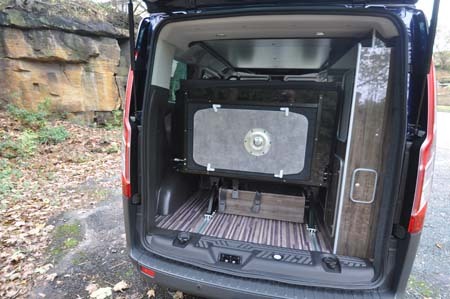 Indeed, the whole vehicle is comprehensively equipped, with but that’s not to say storage has been compromised. If anything, Wellhouse has concentrated even more on this crucial aspect of any campervan. 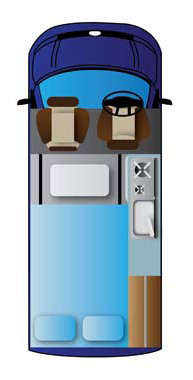 In particular, the flexibility of the sliding rear seat means you can optimise the storage area at the rear, or keep leg room to an absolute maximum. There are also neat lockers over the kitchen. Where can you see one? Wellhouse Leisure sells direct from its Shepley, Yorkshire base, but it has also been busy setting up dealer base that includes highly regarded operators such as Roy Wood Transits in Berkshire. This might just be one of the most significant new vehicle launches for 2014. It’s certainly the most exciting. There’s more information on the Terrier range on the Wellhouse Leisure website and to find out more about our low-cost premiums visit the motorhome insurance discounts page. Having bought one myself, top spec, I can vouch for the fact that everything about it is top quality. Well worth every penny, particularly because Wellhouse are anxious to sort out any problem without any quibble.